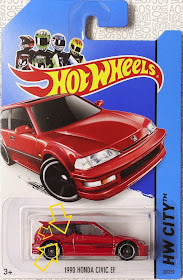 Many of you might already seen this model over and over again but here, i would like to re-introduce this stunning model again before i proceed to reveal on all various kind of errors been spotted from first released in 2014 MAINLINE C CASE series til recently. At the beginning when it first released in mid of November 2013, there are no errors or variants spotted until late November 2013. 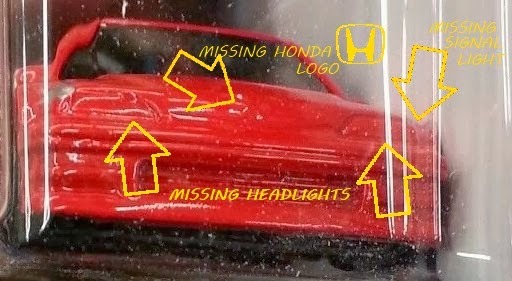 So let's have a look at all angles (front, side, rear & top surface) of this model, shall we. :) I have added all the specifications on the details body tampos for the normal first body color - RED. 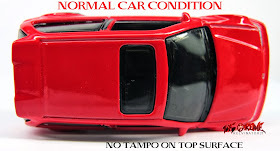 Now, since we are clear on the body tampos and all the normal condition on this model, let's get to the interesting part where we have spotted lots of various errors found specially on this model only. Most of the errors spotted were from U.S. LONG CARD EDITION & just one INTERNATIONAL LONG CARD found with one simple error. Let's begin with the simple errors found on front view. 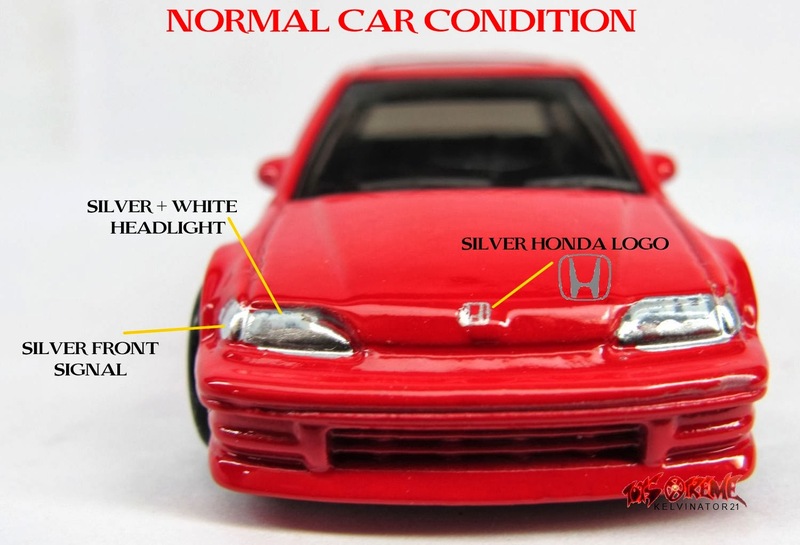 ERROR: OUT OF POSITION FRONT HEADLIGHTS & SIGNAL LIGHTS. 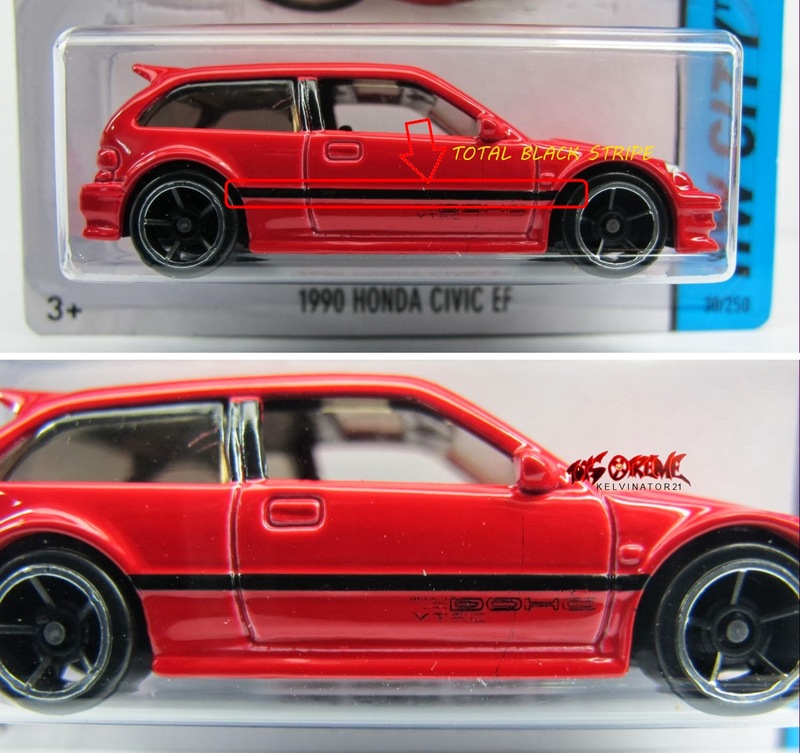 These errors found below are from side view. 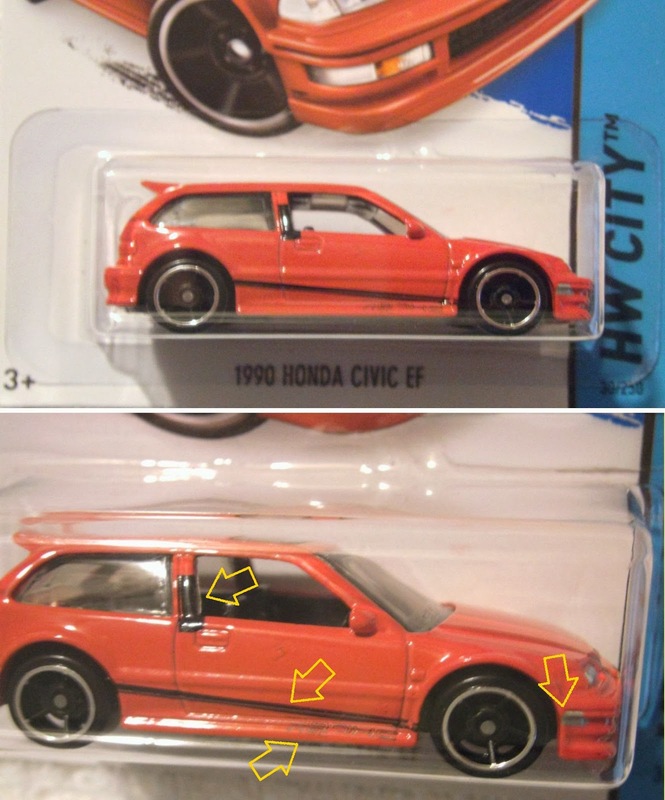 ERROR #1: EXTRA BLACK PAINT ON SIDE. 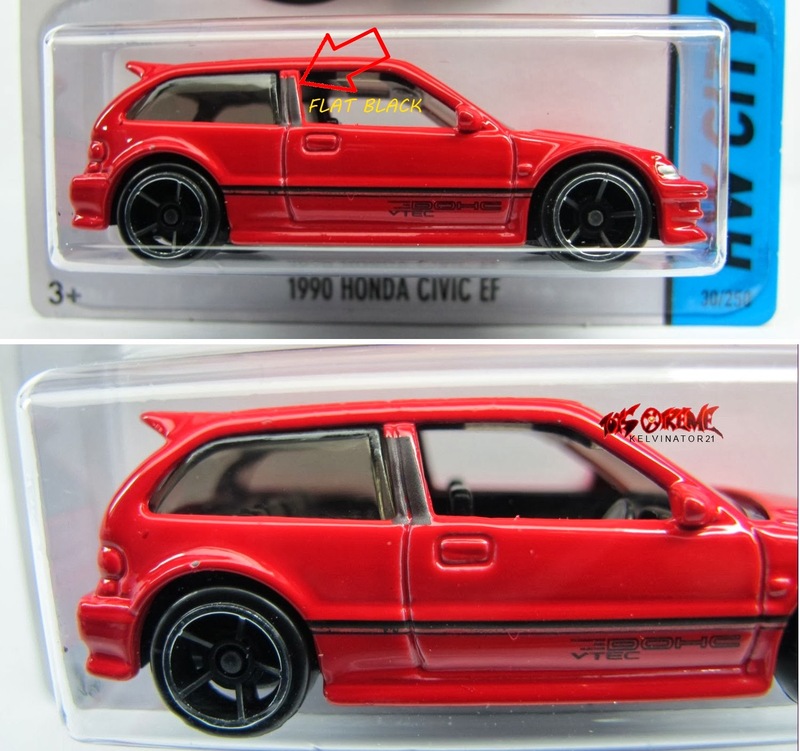 ERROR #2: EXTRA BLACK PAINT ON SIDE. 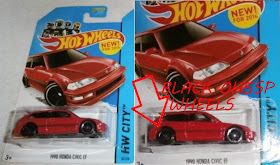 ERROR #3: EXTRA BLACK PAINT ON SIDE. Now, let's look at a bit complex on the 'NOT FITTED' windows. ERROR: CRUSHED FRONT ROOF TOP CAUSES UN-FITTED WINDOWS. ERROR #1: NOT PROPER INSTALLED WINDOWS. ERROR #2: NOT PROPER INSTALLED WINDOWS. 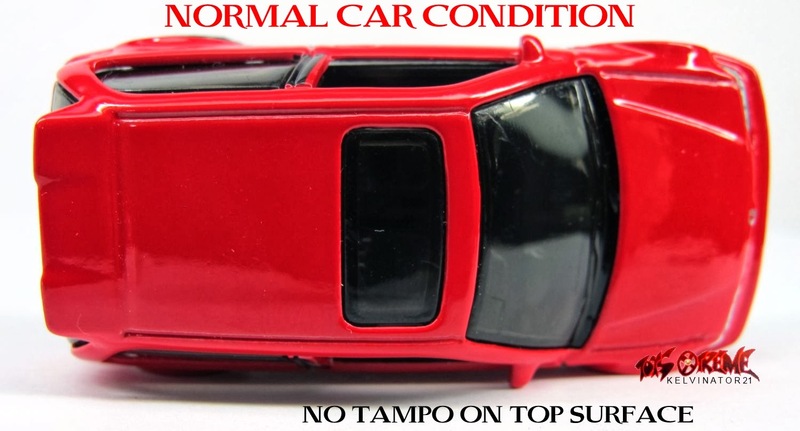 For side body tampos, there's all kinds of conditions such as out of position to missing some parts. Check it out. 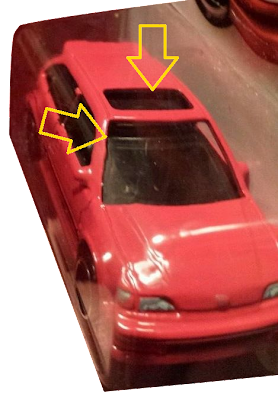 ERROR: WAY OUT OF POSITION AT SIDE TAMPOS + FRONT SIDE SIGNAL LIGHT. 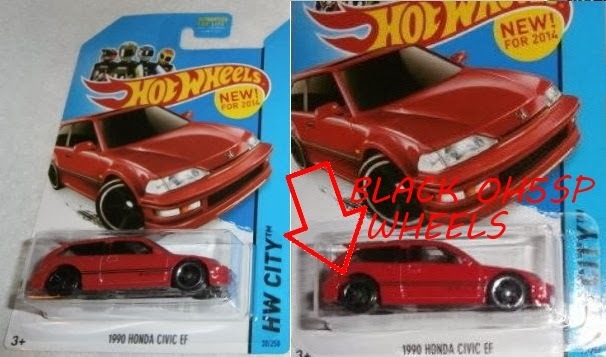 ERROR: MISSING BLACK WORDINGS 'VTEC' + ALMOST MISSING BLACK WORDINGS 'PROGRAMMED FUEL INJECTION'. 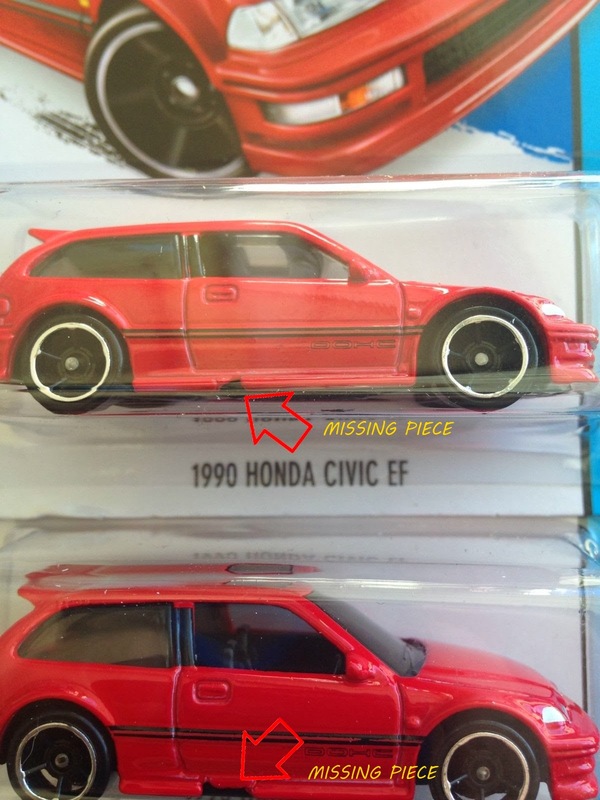 ERROR #1: 2 CARS WITH MISSING SMALL PORTION OF METAL AT SIDE BODY. 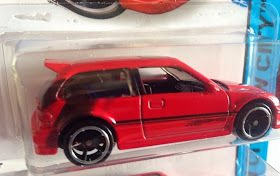 ERROR #2: MISSING SMALL PORTION OF METAL AT SIDE BODY. 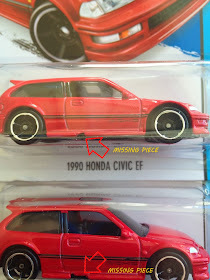 ERROR #3: MISSING SMALL PORTION OF METAL AT SIDE BODY. ERROR: FLAT BLACK PAINTED SIDE FRAME WINDOW. 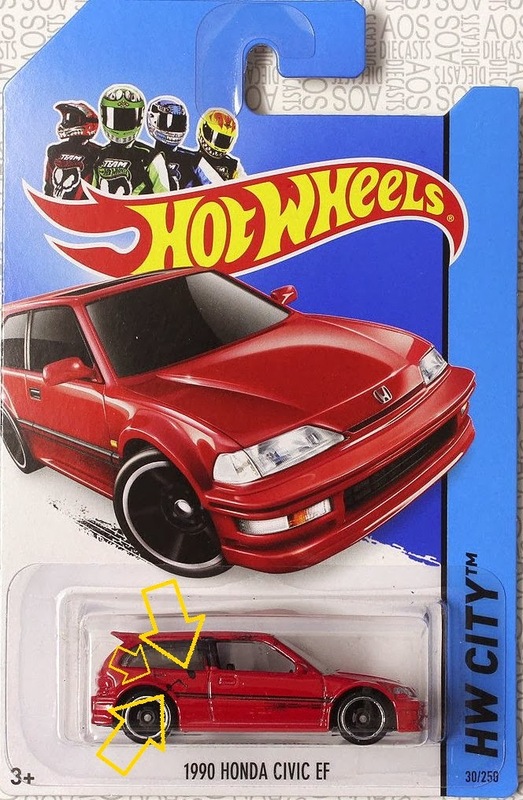 The next part, we will be looking at errors on wheels installed. ERROR: UNPAINTED FRONT CHROME RIMS WITH TOTAL BLACK OH5SP WHEELS. 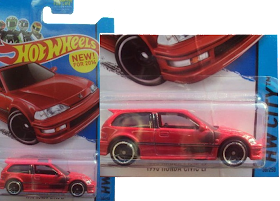 ERROR: UNPAINTED REAR CHROME RIMS WITH TOTAL BLACK OH5SP WHEELS. 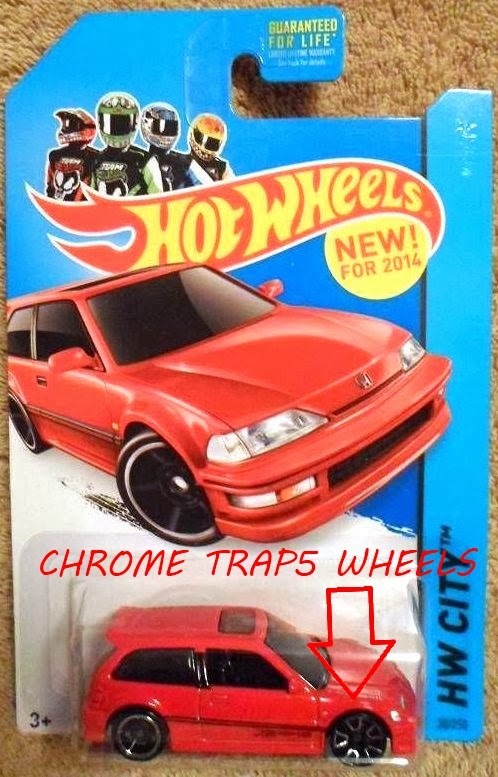 ERROR: WRONGLY INSTALLED FRONT CHROME TRAP5 WHEELS. 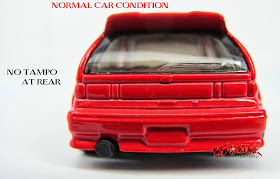 One of the interesting part of this model is the side body tampo that Mattel used are real genius indeed. 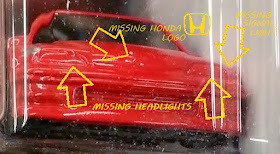 When you look far away, you might not see whether is it just lines or wordings beside the 'DOHC' logo near front wheels. 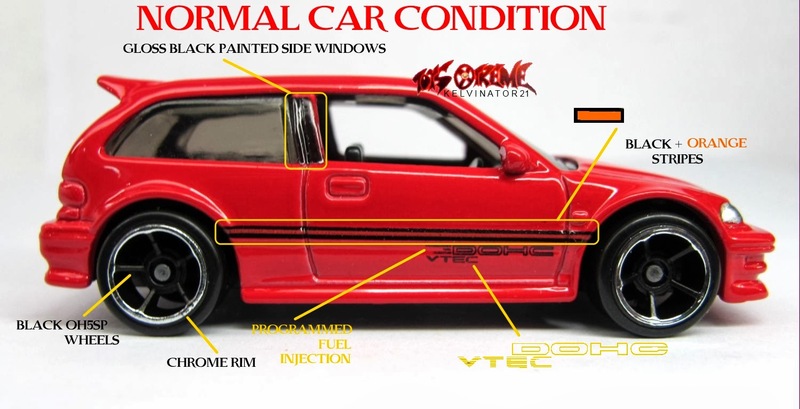 And it is wordings - PROGRAMMED FUEL INJECTION. 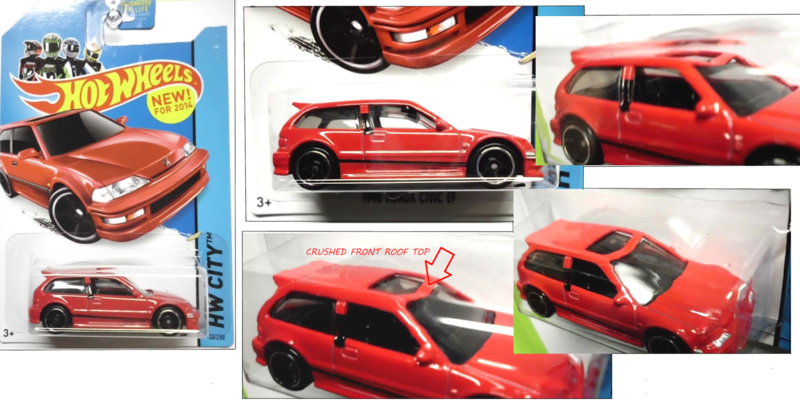 Real cool huh.. Not just that, there's another tampo 'VTEC' which consists of very small lines within the wordings logo. If you check real close on those words, it is very detailed! That's all for now, folks. Hope you enjoy my blog and see you all soon. 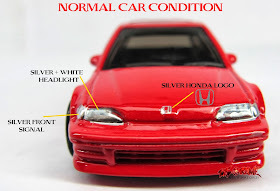 You can Use Car Black Lights to illuminate items in the interior car lights of your car by placing the light sticks anywhere you wish to creat a spectacular effect. 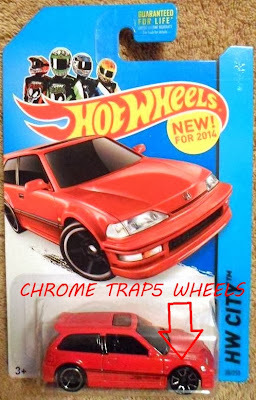 I have the blue one with trap5 wheels on the front.